These closely related subjects have volumes written about them both from many authors of varied ‘qualifications’. Generally, they are attempts to advise the readers ‘what to look for’; vital requirements; points of importance; assorted de-merits; ‘tategoi vs tateshita’; how to spot a Koi that will ‘grow large’ and countless other assorted reasons as to how, why or why not etc. I too have attempted to do this on many occasions in books, articles and by way of lectures given. I have been asked more on these subjects over the past year or so from those out there wishing to ‘Learn the art of Koi appreciation’. Despite all the printed and visual matter (both old and new) all attempts have failed to come up with the goods to date (mine included) because, whilst, for example, a qualified teacher can teach us all the rudiments of piano – albeit over many years, this cannot be said on the above Koi matters. To the people contacting me recently on these subjects I have had to explain to them that it’s almost impossible or probably totally impossible for me to attempt to pass anything on of worth to them. Over recent years, the quality of Koi photographs have exceeded all previous attempts by far yet these, as we know, are merely two-dimensional images. It must also be understood that, along with the increased improvements in image quality, there are also the increased enhancement opportunities that are getting almost impossible to be able to detect. Despite the quality of the finest images, these are little more than ‘yardsticks’ at the best. The ‘judging’ subject is a little easier to explain than the ‘appreciation’ matters. Firstly it is a complete nonsense to be able to ‘judge’ a Koi that is swimming alone in a bowl before you because to ‘judge’ is to ‘compare’. Unless we have another similar Koi to compare against then we cannot even begin to ‘judge’ whilst ‘assessing’ or ‘evaluating’ is another matter that is a possibility to consider. If the two Koi words of ‘judging’ and ‘appreciation’ are lumped together as one then they both lead eventually to an assessment of monetary value which can only really be proven after a particular example has taken a ‘first’ award in a Koi beauty competition – namely a Koi show. Then we must also consider the value of that particular Koi show vs even more prestigious Koi shows on the present-day circuit. Even more importantly, in recent years, Koi shows are the only events where any Koi has a real value or worth. If there were no Koi shows then there would be no need for any ‘rules’ and ‘requirements’. 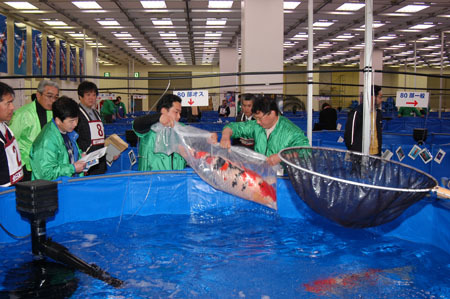 In a very short time after the cessation of shows, all Koi would be priced on the only thing they were priced on when they were first offered for sale to the rest of Japan by the breeders and that is ‘Size and Size Alone’. The only Koi then that would have any real monetary value as such would be the parent Koi that had the ability of producing BIG offspring. In short, they would be little more than colourful, big goldfish – apologies to the goldfish enthusiasts because I have witnessed on many occasions the substantial monetary value of some very special goldfish – albeit for breeding purposes. There has been countless Japanese Koi magazine articles over many years where learned and world-famous Koi breeders have gathered together and discussed all the possible ‘quality’ aspects of Nishikigoi by way of their individual ‘opinions’ and these have all been documented by way of texts and pictures. There is also a very recent book from Japan where many of these breeders and other genuine Koi historians and genuine Koi lovers attempt to pass on some serious information to Koi enthusiasts around the world. Some offer guidelines and ‘what to look for’ tips but if the truth is known these all relate generally to their own particular experiences revolving around a few very special Koi they have witnessed over the many years they have been involved. In truth, these breeders ‘generalise’ based on their own individual experiences but generalisation is not recommended if one applies this to be ‘cast-in-stone’ and unchangeable. The chances of these Koi they wax about being able to be actually found for sale in any overseas outlet is a complete and total zero. Thus, the advice they proffer to the reader will hardly ever be able to be witnessed in any real life situation. These same breeders who will always continue lead the world in Nishikigoi production also know very well the real truth of the matter and have done for many years now. Whilst they are the real masters of the art, they are also painfully aware that the quest for the Holy Grail is little more than the hopes of a lottery win. This is despite the worth of their parent stocks and their incredible ability in making the correct pairings of Oyagoi. The early ‘bloodlines’ that were deemed, in days gone by, to be of vital importance as to perfect parent stocks have long-since been discounted by the guys at the sharp end. Just as a reminder, there were only two varieties ever to be referred to as having ‘bloodlines’ as such and those were Kohaku and Sanke. I first visited the Watanabe family in 1981 eager to see their legendary ‘Jinbei Sanke’ stocks only to be told that they had given up production many years earlier simply because just about every important breeder in Japan had used their offspring to produce their own ‘Jinbei Sanke’ variations – Izumiya was a prominent voice in the promotion of this line, he remains to be so today. On my very first wide-eyed visit to Torazo in 1977 I had heard previous whispers that he produced the Torazo bloodline of Sanke and that ‘Torazo’ translated as ‘Tiger’. I therefore innocently expected to view pond after pond of wonderful Sanke complete with stripes down their sides only to discover not a single one on display. In later years Tsuyoshi’s father confessed that his father’s original lines had long-since stopped production although his offspring were a major contribution to the Jinbei line. The same reasons were given as to why and this was the identical to the reasons Watanabe ceased production of his lines. Mitsuo Hasegawa, (almost unheard of even in Japan until 1995 when I first highlighted him in ‘Koi Kichi’ and later took prominent Japanese breeders to see him for the first time in later years) proudly mentioned to me on my first visit in 1982 that he owned Kohaku from Manzo and Tomoin bloodlines and would NEVER even consider mixing the offspring produced. In those days it was visually evident that the two entirely different qualities of these lines could be easily witnessed in the Kohaku he had for sale. The Manzo offspring had almost a ‘savage beni’ pigmentation whilst the Tomoin offspring had the quiet and classic, almost-yellow beni skin. It was around 1996 or so when I began to notice ‘a mixture’ of appearances and Hasegawa San confessed he was then using a mix of these two lines in his current Oyagoi.